When you hear an ambulance siren, you can broadly estimate whether it is close or far away based on how loud it is. In principle, there could exist ‘loud’ ambulances and ‘quiet’ ones, but probably in the city you live, all the ambulances are more or less standardized. In such a case, how loud you hear the siren will tell you something about the distance away. Gravitational waves happen to work in a very similar away. The amplitude of the wave is much like the loudness of a sound. Objects that give off a ‘standardized’ amplitude of wave are called ‘standard sirens’. Measuring the gravitational waves from such objects tells us how far away they are. 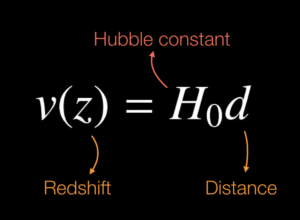 Besides distance, another important measurement in cosmology is the redshift of objects. As explained in previous Darchives, like this one also on gravitational waves, redshift is a type of Doppler shift when objects are moving away from us. In cosmology, the redshift of a distant galaxy is primarily caused by the expansion of space. Larger redshift means a higher rate of expansion of space. where v is the recession velocity of the galaxy, which depends on its redshift z, H0 is the Hubble constant and d is the distance away. This expansion parameter, H0 is currently a hot button topic in cosmology. While many experiments broadly agree with a model of the Universe called LCDM, in the past decade, different experiments cannot seem to agree on the measurement of H0. The primary ways of measuring H0 come from measurements of Supernovae and the Cosmic Microwave Background (CMB). Many have tried in recent years to understand why these measurements give different values of H0. It is still heavily debated which, if either set of experiments might be wrong. If neither is wrong, it could be a sign that we are missing out on some key element in our models of the Universe (e.g. new types of particles or laws of physics) which may be the most exciting result. Gravitational wave events are a new way to measure H0. Given the Hubble law above, if we are able to identify the host galaxy of a gravitational wave event and measure its redshift, we can also derive a value for the Hubble constant. This was done for the first GW event with an electromagnetic counterpart, GW170817 as discussed in a previous Darchive. However, we have not been able to detect the electromagnetic counterpart (and thus we have not identified the host galaxy) for all the other gravitational wave events detected so far. This is because they were all collisions of black holes, from which we do not expect to see any detectable radiation (light). We call these events “dark sirens”. They can be treated similarly to the bright events, but instead of having only one host galaxy, we have to take into account all of the potential host galaxies that DES has observed using a statistical scheme. The LIGO-Virgo gravitational wave detectors provide a high probability “sky map” (Figure 1) of where the wave emanated from. 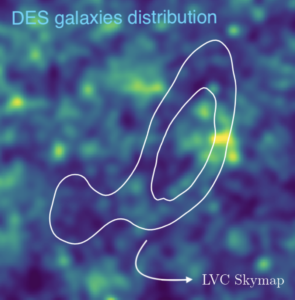 From this map, DES can select the potential host galaxies from its images of that region of the sky. Figure 1: Stellar mass distribution of the DES galaxies used in this analysis (color map) and the LIGO-Virgo GW170814 high probability sky map (white contours). The sky map shows the area that contains the GW source with 50 (inner contour) and 90% (outer contour) probability. There are ~77,000 possible host galaxies within the 90% probability region. In this paper (https://arxiv.org/abs/1901.01540 ), we have performed the first measurement of the Hubble constant from a dark siren (see Figure 2). We used the best DES data we had available (the Year 3 GOLD catalog) and the GW data from the collision of two black holes GW170814, detected in 2017 by LIGO and Virgo. 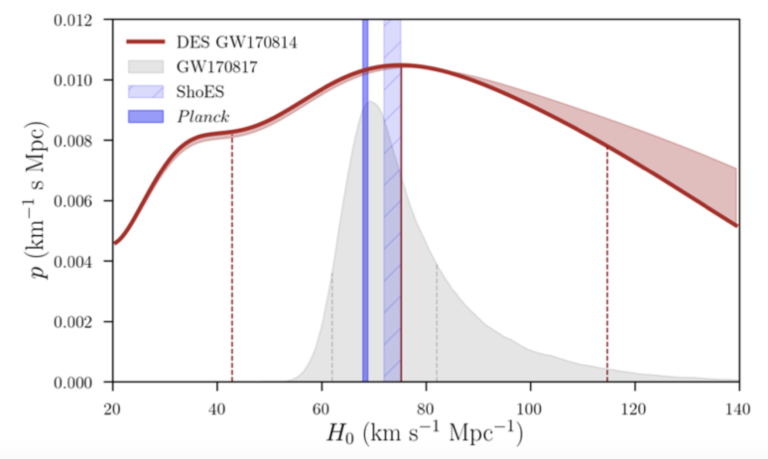 It is not possible to derive a precise measurement of the Hubble constant from just one dark siren, but we expect to have roughly one event of this type per week during 2019. We anticipate that we will need roughly 100 dark sirens to start providing results which are competitive with other well-established methods. The exciting era of precision cosmology with standard sirens is not too far away, and it may be able to solve the tension between the results from different experiments. This new tool for cosmologists may lead to invaluable measurements in understanding the Universe. Figure 2: Inference of the Hubble constant H0 from this work (red curve), compared to other measurements. Shoes is a Supernovae measurement, and Planck is a CMB experiment. The curves show the relative probability for different values of H0, ranging between 20 and 140 km/s/Mpc. The peak of the distribution resulting from our measurement, corresponding to the most likely value of H0, is at 75 km/s/Mpc, and it is very close to the value measured by other experiments (shown by the purple bands). The inference made using GW170817 data, which had an electromagnetic counterpart and a single host galaxy redshift, is shown in grey. This distribution is much more peaked than the red one, meaning that it is a more precise measurement. This is a consequence of the fact that for this work we have 77,000 possible galaxies instead of one, and thus there is a lot more uncertainty on the position of the GW source. Antonella is author of this Darchive and lead author of this study. 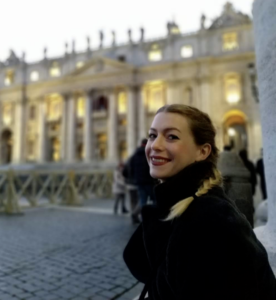 She is a postdoctoral researcher at the Fermi National Accelerator Laboratory, in Illinois, and she leads the galaxy evolution in clusters analysis team. Her main interests include gravitational waves, ‘ripples’ of spacetime that are produced, in the most violent cases, by catastrophic events such as black holes or neutron stars merging. Antonella is involved in the search of the sources of these events with DES, and she uses host galaxies data to understand the formation of these sources and the expansion of the Universe. Another of her science interests is galaxy clusters. Clusters of galaxies are the largest gravitationally bound structures in the universe and they carry a lot of interesting information about gravity, the universe, and the galaxies within them. Antonella is working on weighing galaxy clusters using the light from clusters galaxy members that we see through DES data. She studies how much mass in clusters ends up building stars and how this relates to the total cluster mass, mainly the dark matter that we do not directly see from DES. Such estimate is a first step towards inferring cosmological parameters using the abundance of galaxy clusters. Ross is a postdoctoral researcher at the University of Wisconsin-Madison. 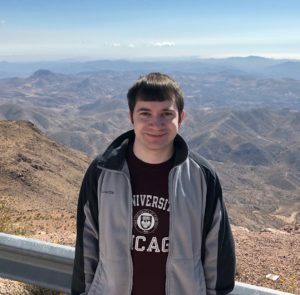 He works on various projects studying the large-scale structure of the Universe using the millions of galaxies DES observes. These projects include galaxy clustering, correlations of structure with the cosmic microwave background and using the structure of the Universe to infer the redshifts of galaxies. Ross also co-coordinates Education and Public Outreach efforts in DES, including managing the darchives and social media.